Notes about Amstrad receivers SRD510, 520, 540, 545, 550. (Also some SRX export models - SRX320 etc. and SRD650 (SATKIT 21). If you find this information useful and want to thank me, why not buy one of our low-cost "virtual books" that you can download direct to your computer? My books can be read on-screen or printed out on paper. They are full of colour photos and illustrations. Tells you which components usually fail, including typical fault symptoms. 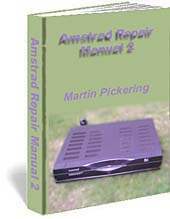 These Amstrad receivers are initially built with low-cost, poor quality components that degrade with time and temperature. You can improve picture quality and reliability by fitting our Reliability Upgrade kit RELKIT 3. The kit includes instructions which will assist you to prevent future problems. Fit this kit before trying to trace a fault cause because in 9 cases out of 10, it will cure the fault anyway. This kit will also fix a "dead" receiver in most instances (about five in six "dead" receivers can be repaired with this kit alone). However, if the fusible 2R2 resistor (R604) has gone open-circuit (see picture), then you will also need to fit the parts from our supplementary kit, SATKIT 3A (use SATKIT 21 for SRD650). You can often check R604 just by looking for a black mark where the paint has come off, although it's better to measure it with a meter. PSU used in SRD510, SRD520, SRX310, SRX320. SRX540, 545, 550, 650 used a different transformer T600 to give more current and a higher tuning voltage (30 volts in place of 25 volts). The later transformer (LLP006 or LLP007) may be used in earlier models but BE SURE to replace all electrolytic capacitors on the tuning voltage supply with 35v rated ones. There are also other differences, most of which are not significant. Export models (SRX) use 100k/350v resistors in place of 47k/350v. SRD650 uses a 150uF/400v capacitor in place of 68uF/400v. Quite different from the rest. Relkit 4 will be needed. Satkit 4A will also be needed if the main transistor has failed. This 199 channel upgrade also provides a new menu option that allows you to control the voltage on Decoder Scart pin 14. Used in conjunction with our internal 22kHz tone board, this option will give you high/low band switching on a "Universal" LNB. Yes, this is possible but you need the tuner and the 199 channel micro. We stopped offering this kit because it costs more than an SRD550 ! We have boxes full of scrap mother boards, decoders, tuner modules, you name it. Used spare parts available on request. We can also supply most new parts, too. These notes also apply to SRX export models which use the AMS41565 microcontroller. There are no upgrades available for this model. 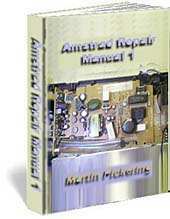 There are no upgrades available for this model but you can fit Relkit 4 and Satkit 4A to fix a dead power supply. Fit the Relkit 4 first and, if this doesn't cure it, fit the supplementary Satkit 4A. Fit the Relkit 4 alone to fix picture problems (blank screen or dull picture), "no audio" or "channel number display flashes". Disconnect the receiver from the mains power supply and disconnect all cables. Remove seven cover screws (plus two more recessed underneath if cover is plastic). Remove two screws which secure the power supply assembly. WARNING! The large capacitor may hold a charge. Lift out the power supply assembly and rest it outside the housing. Remove the single screw which secures the card reader assembly. Raise the rear of this board off its pin next to the screw hole then use a screwdriver in the front slotted sections to break any glue bond. Be extremely careful not to crack this board. Leave it in position once it is freed from any glue. Use a magnetic screwdriver to remove the single screw from inside the hole in the metal box which houses the decoder. Remove the two or three screws which secure the main board assembly. With your left hand, lift the card reader assembly up and as far forward as possible. At the same time, with your right hand, lift the decoder metal box up and, by tilting it, move it forwards away from the main board assembly. Then use both hands to release the front plastic clips at each side of the main board assembly. Lift the front of this board and pull it forwards and clear of the clips. Take great care not to flex or crack it! The main board assembly can now be turned upside down to gain access to the underside. Note: when reassembling receiver with plastic cover, the rear left side screw is threaded to fit the brass bush insert! Upgraded the SRD520 PSU and the main board in just 20 minutes and switched on to see a "beautiful picture" of Bravo. I can not thank you or praise you highly enough for the excellent response and the value for money which I have received. In the nicest possible way, I hope not to need you again.